The Investigation Into The Las Vegas Shooting Has Ended. Here's What We've Learned. After approximately 10 months of investigating the Las Vegas shooting, Clark County Sheriff Joe Lombardo on Friday told reporters they're still unsure why Stephen Paddock carried out the attack on Oct. 1, 2017, Guns.com reported. The news conference came after investigators released a 187-page report explaining what they discovered about the shooter and his potential motives. "In reference to the 2,000 investigated leads, 22,000 hours of video, 252,000 images obtained and approximately 1,000 served legal processes, nothing was found to indicate motive on the part of Paddock or that he acted with anyone else," the reported said. According to Lombardo, Paddock's physician described him as someone who had the characteristics of someone who suffered from bipolar disorder. Family and friends described Paddock as a frequent hobbyist who would dive into new hobbies on a whim before abruptly moving to his next obsession. Danley believed Paddock’s new found interest in guns was merely a hobby. Packages began arriving at the residence frequently, and Paddock would open the packages in the garage. Paddock often went to gun stores and gun shows. Danley accompanied Paddock on a few trips to gun stores but did not pay attention to the transactions. Danley also accompanied Paddock to an unofficial gun range located near the waste management landfill near Mesquite. Danley helped set up targets at long distances for Paddock to shoot with the rifles. After target shooting with the various rifles, Paddock would clean them in the garage. Danley helped Paddock load magazines and move ammunition on more than one occasion. Although Paddock owned 67 firearms at the time of his death, nothing in the weeks leading up to the event suggested that he would carry out a mass shooting. As stated earlier in this report, investigators were unable to uncover or discover what Paddock’s motive may have been. While motive may have eluded investigators, there were certain indicators of intent shown by Paddock which lead up to the mass shooting. 1) Paddock had a reservation for a hotel during the Lollapalooza music festival held at Grant Park in Chicago, Illinois during the month of August. Like the Route 91 Harvest music festival, the Lollapalooza festival was held in an open-air venue. Paddock specifically requested a room overlooking the venue when he made the reservation. That reservation was cancelled two days prior to the check-in date. 2) Paddock made lodging reservations during the Life Is Beautiful music festival held in downtown Las Vegas. The festival was also an open-air music venue attended by thousands of people. Paddock requested units overlooking the venue. Paddock reserved three different units during the period and all faced the venue. Paddock was observed in video surveillance transporting several suitcases from his vehicle to the units he reserved. Paddock was alone for the trip and was never accompanied by anyone for more than a casual conversation. Investigators have been unable to determine if Paddock intended an attack during this festival or if he used it as a means to plan a future attack. 3) Paddock conducted several internet searches while planning his actions. 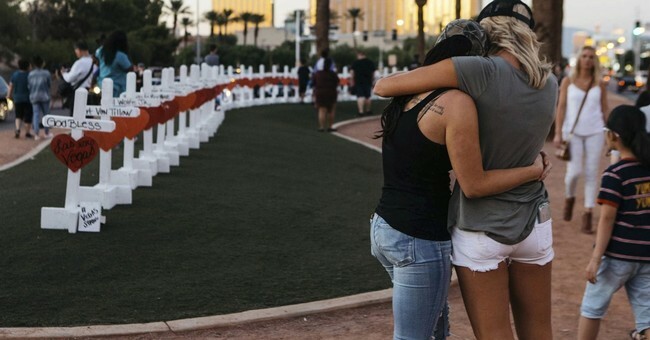 Search terms included open-air concert venues, Las Vegas SWAT tactics, weapons, and explosives. Paddock also searched for various gun stores. 4) Paddock purchased over 55 firearms, which were mostly rifles in various calibers, from October 2016 to September 2017. He bought over 100 firearm-related items through various retailers during that period. 5) During a stay in early September 2017, Paddock requested specific rooms that overlooked the Las Vegas Village. According to Danley, Paddock spent time looking at the Las Vegas Village venue from different angles and windows while inside the room. Although the shooting doesn't qualify as a mass shooting under federal standards, Lombardo said he personally disagrees. MGM Resorts International filed a lawsuit against the victims last month. The goal of the lawsuit was to seek a relief of liability.